If, when I attain Buddhahood, sentient beings in the lands of the ten quarters who sincerely and joyfully entrust themselves to me, desire to be born in my land, and call my Name, even ten times, should not be born there, may I not attain perfect Enlightenment. Excluded, however, are those who commit the five greatest offenses and abuse the right Dharma. Dharmakara now entered the cycle of rebirths in order to attain full enlightenment. After billions of years he achieved his goal and became the Buddha Amithaba (the Buddha of Infinite Light). He immediately created his Pure Land. 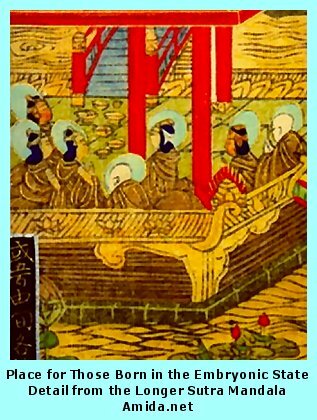 Amitabha's spiritual state is that of a transcendental Buddha, which means that he has not departed for nirvana, but is present in his portion of the universe teaching the dharma and welcoming anyone who wants to enter his realm. We must understand that in Mahayana cosmology the idea that different Buddhas oversee different regions of the universe is a common conception. Paradoxically, the sutras refer to the universe as the "lands of the ten quarters." It includes the abodes of Buddhas and bodhisattvas, and actually there are myriads of Buddha fields. However, the "western" paradise of Amitabhra is distinguished from the others by its perfection in all aspects. "Calling on the Buddha's name" became embodied in a mantra, which in Japanese is called the nembutsu. This term is derived from the Sanskrit Namas Amitabhaya Buddhaya (or, more correct: Namo'mitabhaya Bhuddaya which means "I worship (or "bow down") the Buddha Amitabha." From there it turned into the Japanese Namu-Amida-Butsu, or Nembutsu. Some writers give a different interpretation of the phrase by saying that Nem in Nembutsu is derived from the Japanese nen, taken over from the Chinese nien, both of which mean "to remember" or "to contemplate." They rightly acknowledge that the original Sanskrit would have been Amitabha smriti, a valid concept for Pure Land Buddhism, but the former derivation seems to be less forced. A highly questionable understanding is one that limits the derivation of the term to Japanese alone, ignoring its obvious antecedents in Chinese and Sanskrit. Furthermore, to read exclusivity (i.e. Amida alone) into the phrase itself is a philosophical expansion that is not integral to the phrase. We'll come back to the nature of the nembutsu later on. Buddhists had used this formula for a long time before it became integral to the newly-formed Japanese Pure Land Schools. A point of discussion that we need to address later will be whether the number "ten" is supposed to be an exact requirement or whether it simply stands for an indefinite number greater than zero. The three fundamental sutras depict the Pure Land in extremely lavish terms, to the point where one has to realize that the descriptions are not intended to be literal, but figurative, trying to represent a transcendent beauty that goes far beyond common human perceptions. But as this True Pure Land is formless and infinite, Amida has accommodated it to our finite and limited comprehension by the skilfull means of giving it symbolical forms drawn from human sense-perception as a Temporary or Transformed Pure Land, whose reality is manifested on the imaginal plane. Seven-jeweled trees completely fill that land. There are some made of gold, some of silver, and others made of beryl, crystal, coral, ruby or agate. 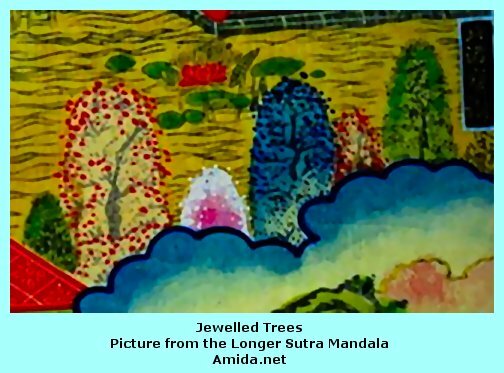 There are also trees made of two to seven kinds of jewels. There are gold trees with leaves, flowers and fruits of silver; silver trees with leaves, flowers and fruits of gold; beryl trees with leaves, flowers and fruits of crystal; crystal trees with leaves, flowers and fruits of beryl; coral trees with leaves, flowers and fruits of ruby; ruby trees with leaves, flowers and fruits of beryl; agate trees with leaves, flowers and fruits made of various jewels. "At mealtimes, plates made of the seven jewels -- namely, gold, silver, beryl, agate, ruby, coral, and amber, and also moon-bright pearl --spontaneously appear, filled with food and drink of a hundred tastes, according to one's wishes. Although the food is offered, no one actually eats it. Once it has been seen and smelt, one naturally feels that it has been eaten, and so is satisfied; thus one feels relaxed in mind and body, free from attachment to the sense of taste. When the meal is over, everything disappears, but reappears at the next mealtime." The virtue and wisdom of shravakas [disciples] and bodhisattvas in the land of Amitayus are indescribable. By this time Sakyamuni's audience in the sutra has changed. He is now addressing the boddhisattva Maitreya, other human beings, and--surprisingly--gods (devas). The surprise lies in the fact that Buddhism usually teaches that only human beings can attain nirvana, thereby closing the door to the gods, who need to wait until eventually their karma permits them to be reborn as humans. See Buddhist the cosmology as illustrated by the Tibetan bhavachakra mandala. However, entry into the Pure Land is not the same thing as attaining nirvana, and everyone who is reborn into the Pure Land will do so as a male human being. Thereby nirvana is made possible as a next step for gods as well as for beings who stand below humans. Devas, humans and lesser beings, including even those that crawl, have all been blessed by your compassionate guidance and have thereby attained deliverance from suffering and affliction. It is significant that by this time he follows up immediately by persuading his listeners to pursue the "Way" (dharma) to the Pure Land. That land is sublime, blissful, serene and pure. Why do you not diligently practice good, reflect on the naturalness of the Way and realize that it is above all discriminations and is boundlessly pervasive? You should each make a great effort to attain it. Strive to escape from Samsara and be born in the Land of Peace and Provision. Then, the causes of the five evil realms having been destroyed, they will naturally cease to be, and so you will progress unhindered in your pursuit of the Way. No one is entitled to be born into the Pure Land, but everyone is invited. We see here that anyone, once located in the Pure Land, will find it very easy to continue the journey and take the final step to nirvana. Later on, the question as to whether the Pure Land and nirvana are synonymous became a topic of discussion. As the Buddha continues this exposition, he declares that sadly not many people devote themselves to attaining it. The Pure Land is easy to reach, but very few actually go there. It rejects nobody, but naturally and unfailingly attracts beings. Why do you not abandon worldly matters and strive to enter the Way? If you do, you will obtain an infinitely long life and one of limitless bliss. If here in this world you are upright in thought and will, and abstain from doing evil, then you will attain the utmost virtue, unsurpassed in all the lands throughout the ten quarters. Why is this so? Devas and humans in the Buddha-lands naturally do good and rarely commit evil, and so, it is easy to teach and train them. 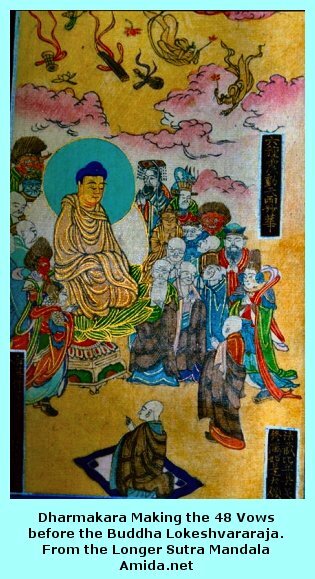 As it turns out, the Larger Sutra even goes on to makes a definite distinction between those beings who passed away in the full wisdom of Amitabha and those who are only half-convinced. The former, upon death, are immediately reborn and transformed into full residents of the Pure Land, while the latter must first pass through a period of development in preparation for the next birth. Then the Bodhisattva Maitreya said to the Buddha, "World-Honored One, for what reason are some of the inhabitants of that land in the embryonic state and the others born by transformation?" The Buddha replied, "Maitreya, if there are sentient beings who do various meritorious deeds aspiring for birth in that land while still entertaining doubt, such beings are unable to comprehend the Buddha-wisdom, inconceivable wisdom, ineffable wisdom, boundless Mahayana wisdom, and incomparable, unequaled, and unsurpassed supreme wisdom. Although they doubt these wisdoms, they still believe in retribution for evil and reward for virtue and so cultivate a stock of merits, aspiring for birth in that land. The Meditation Sutra, part 1, sec.7, states the requirements for relocating into the Pure Land in very straightforward terms. Those who wish to be born in that country of Buddha have to cultivate a threefold goodness. First, they should act in proper filial fashion towards their parents and support them; serve and respect their teachers and elders; be of compassionate mind, abstain from doing any injury, and cultivate the ten virtuous actions. Second, they should take and observe the vow of seeking refuge with the Three jewels, fulfill all moral precepts, and not lower their dignity or neglect any ceremonial observance. Third, they should give their whole mind to the attainment of perfect wisdom, deeply believe in the principle of cause and effect, study and recite the Mahayana doctrine, and persuade and encourage others who pursue the same course as themselves.